Are you interested in tightening, toning and firming your skin? If your answer is yes, then you need to try the It Works Ultimate Body Applicator! 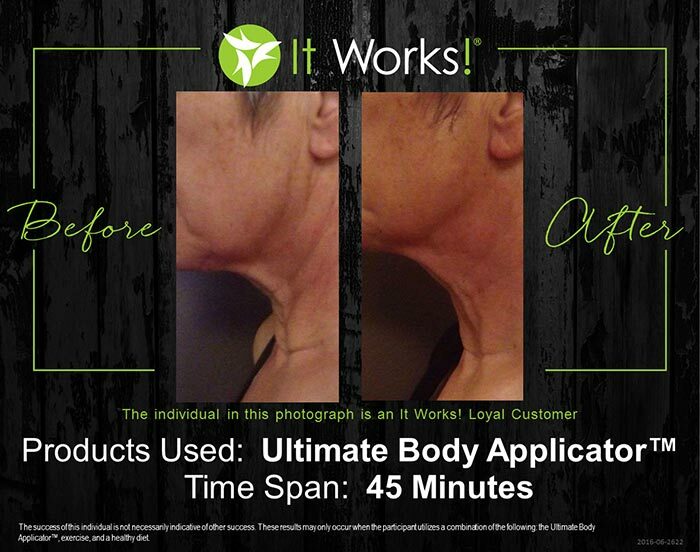 (aka It Works Body Wraps). Our product formulator Luis Mijares has put his years of experience as an herbalist to create this amazing easy to use, mess free applicator. Simply wrap the problem area anywhere on your body and the botanically infused ingredients in the applicator immediately go to work to tighten tone and firm your skin. You will see noticeable results in as little as 45 minutes. Click on the thumbnails below to see the amazing before & after results! Disclaimer: It Works and its Independent Representatives Make No Curative Claims These Statements Have Not Been Evaluated by the FDA These Products are Not Intended to Diagnose, Treat, Cure, or Prevent Any Disease.